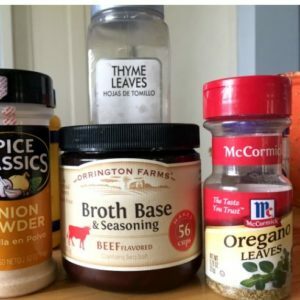 May 16, 2017 0 comments on "Spaghetti Sauce Seasoning Mix"
If you are wanting to ditch store bought seasoning mix packets and make your own, then you will want to give this homemade spaghetti sauce seasoning mix a try. You probably already have all the ingredients you need on hand to make it. You will soon find yourself ditching the McCormick spaghetti seasoning packets from Walmart and start making your own! Mix all the above ingredients together and store in a ziploc bag or mason jar. This recipe replaces one packet of store bought mix. To prepare the spaghetti, brown 1 pound of ground beef. Stir in seasoning mix, 1 large can crushed tomatoes (undrained), 1 8-ounce can tomato sauce, 1/2 c. water. Heat for approximately 20 minutes or until mixture is heated through. Serve with cooked spaghetti noodles. Like this recipe? You might also like my recipe for canning spaghetti sauce.